When was the last time you did something for the first time? The want for a new rush, a new high, should make decisions like bungee jumping easy, right? Memories from your travels rarely come from a souvenir. It’s the things you’ve done somewhere that stick with you forever, and give you the best stories to share to make your boys jealous that they didn’t come with you. Bungee jumping had been on my bucket list for quite some time, and what better place to do it than in South Africa? Johannesburg has become a second home to me. I love the city, the friends I’ve made, and the warm reception I get the moment I land. This particular visit was my third time in the city, and I was looking for something that would make this experience in the city just as memorable as my previous visits. Somehow, in my mind, that meant plunging to the earth from an insane height with nothing but an exaggerated rubber band to keep me from slow singing and flower bringing. Orlando Towers is situated in Soweto, a township in Johannesburg. The former coal-fired power station has been repurposed into an extreme sports site, with rock climbing, indoor skydiving, and of course, bungee jumping. Situated 328 feet above ground, the jump is one of the highest in the country. We arrived and my driver was convinced I was crazy. He’d seen people chicken out at various points before the jump and was sure I’d come to my senses and do the same. I had to prove to him, and most importantly, the voices in my head, that I wouldn’t. We walked into the office and the jump crew went to work. They weighed me, to properly calibrate the bungee for my jump. I felt safe the entire time, and honestly, everything before the jump felt like a blur, but the key “things are going as they should” moments were met and I never felt like my actual death was impending, just that imaginary death that makes the back of your neck itch with a chill of intense dread. I signed my life away and the jump team immediately began to brace my body with padding and protective gear (which begged the question, “What am I going to hit, or what’s going to hit me that required all of this protection?”). For those who may hesitate at moments like this, the key is to decide it’s already done. Just keep pushing forward until the experience is complete, because the moment you stop to think about what you’re doing, the fact that you’re voluntarily throwing yourself from a ridiculous height, just to plunge to the earth, you’re brain may catch up with your foolishness and make the decision for you. I was accompanied by a team of five on what resembled an elevator you’d find in a mine shaft, aligned to the structure of the left tower. On a ride that felt like forever, the 328 foot drop slowly became a little realer with each passing moment. At the top, I slowly walked the suspension bridge connecting the two towers. The wind swiftly bounced the bridge back and forth as I headed to the jumping point, situated directly between the towers, and in that moment, I began to feel about three times heavier than I was. Throughout the journey to the descent, one of the crew members asked if I was “Okay?” and I wondered if this was their way of giving people an out. At this point, the credit card swipe has cleared and you’re not getting that money back, so it’s no loss to them, and a major loss of ego for you. I wanted to jump with my manhood and ego intact, so to them, okay I was, even if I wasn’t so sure. Once they latched the cord onto my newly fitted body armor, things began to speed up. That blur I mentioned earlier, became 4K clear as I was beckoned to walk to the edge of the bridge that contained no barrier. As the wind picked up, “Don’t hold on to anything” was yelled out to me, which is incredibly hard to not do when you’re staring straight down at the ground hundreds of feet beneath you. My feet kissed the edge of the platform, and the team wasted no time counting down, which in retrospect I’m thankful before because at this point, there’s no turning back. I cleared my mental cache of doubt and let myself fall into the open abyss. I’m sure I dove right into the darkest corner of Pandora’s box, the one that holds that weirdly addictive mix of adrenaline and bliss, only to have that first bounce from the bungee responding to my body weight pull me back into reality before I could get comfortable in the new space. But it was too late. I’d tasted a new high and yet a new low. In that moment, I became a junkie of a different drug, immediately in need of my next hit. As if I’d separated from my body, I heard my scream shift from terror to chaotic laughter as my brain realized this was in fact, something I’d done for fun and today wasn’t my last day on earth. That twisted emotion forced me to acknowledge that I couldn’t wait to do it again and as the bounces lost their intensity and the crew slowly lowered me to the ground, I began to plot on my next trip to Pandora’s box. 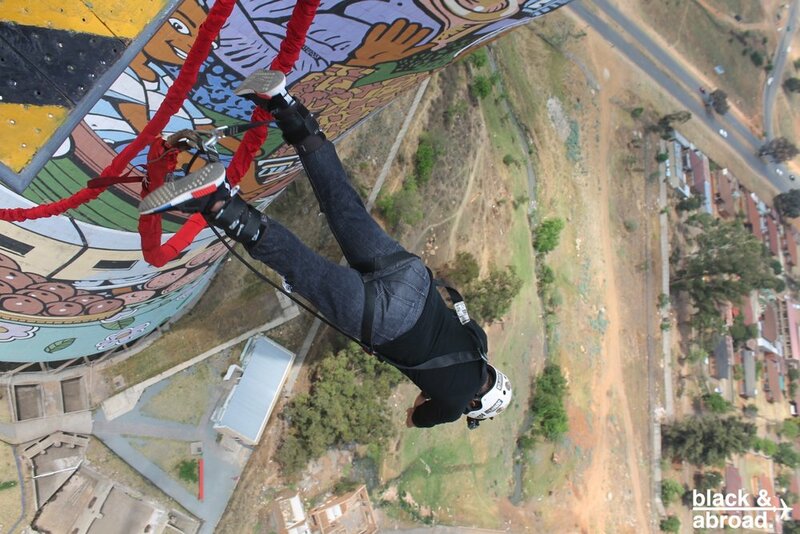 This experience was sponsored by the Joburg Tourism Board and the Orlando Towers Vertical Adventure Centre.